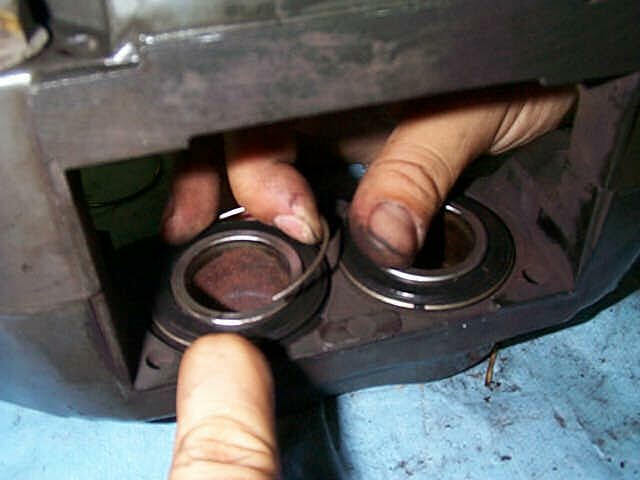 After serious use, the seals on the brake caliper pistons will wear our & start to leak. 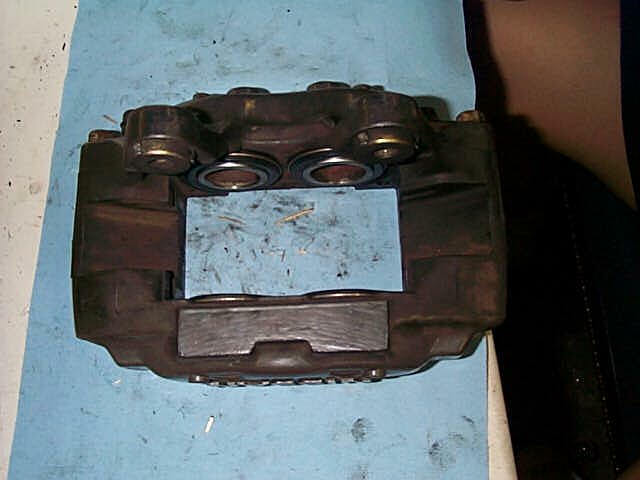 Rebuilding is fairly simple and much cheaper then replacing the entire caliper. 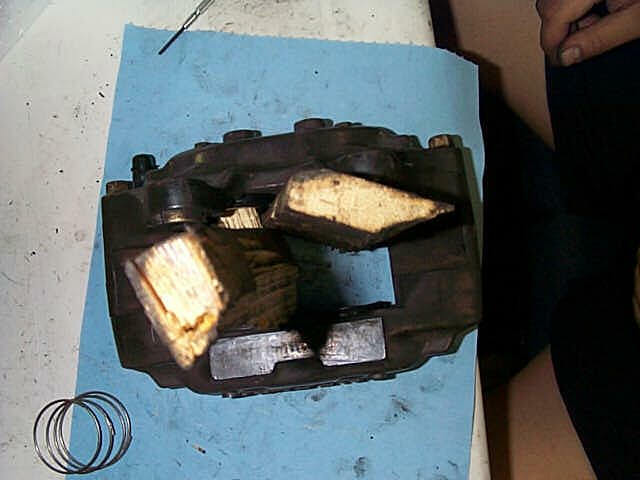 I rebuilt the seals in my Skyline calipers but the kit is the same as the 300ZX's. In fact the pistons are also the same size, it's just the size of the rotors making the difference in braking performance. 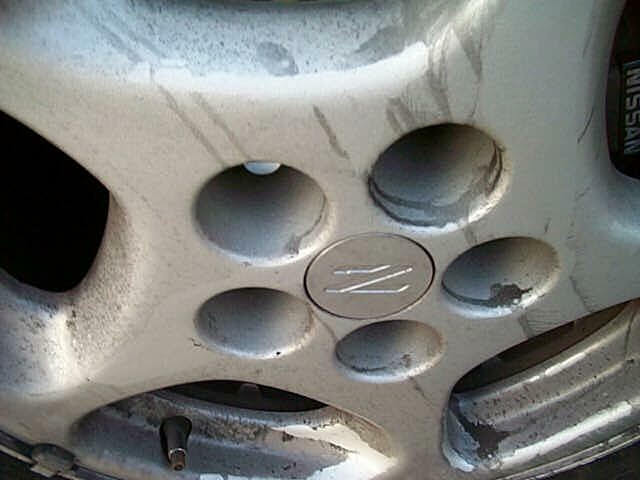 When any wheel start looking like this (1.). 1. Take off the wheels and remove the calipers using the Brake rotor replacement page. 2. Once the caliper is off the car, disassemble the brake pad hardware completely. Spray down the caliper and clean it off as much as possible with brake cleaner and a stiff brush (2.). 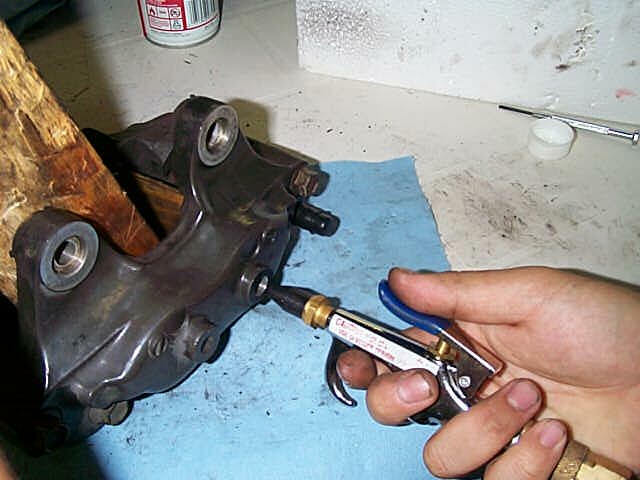 Use a C-clamp to squeeze the pistons back into the caliper and to squeeze out the excess brake fluid. 3. 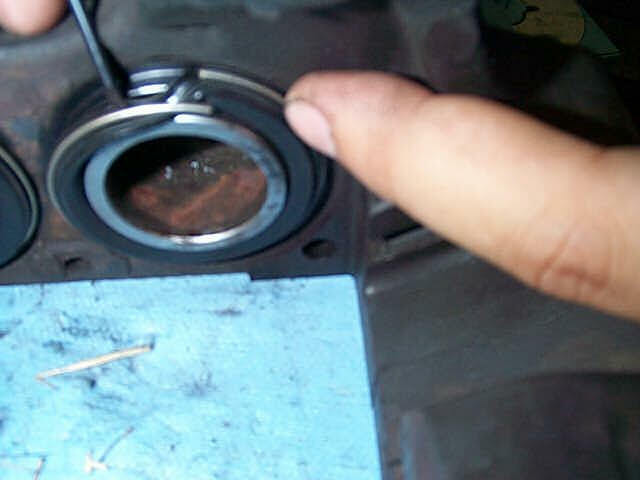 Use a small screwdriver to remove the dust boot ring from around the piston (3.). 4. 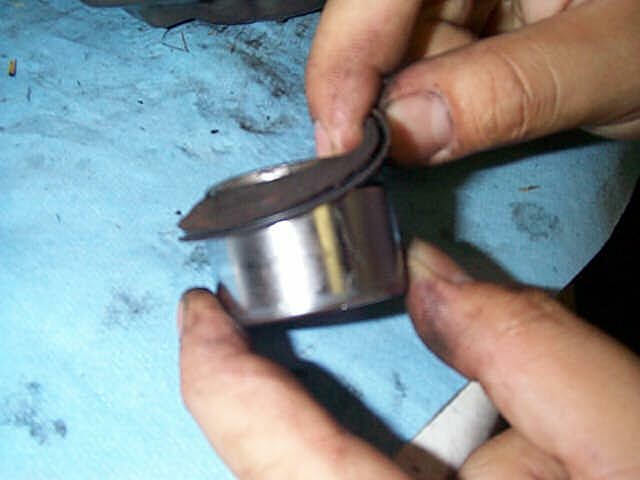 Take a piece of wood approximately 2" to 2.5" thick and place it between two of the pistons to hold them in place (4.). Then use a slim piece of wood and place it between the other two pistons to prevent them from hitting eachother when you push them out with the air gun (5.). WARNING: Wear safety goggles because brake fluid will probably splatter and using air pressure on the pistons can cause them to be projectiles. Watch your hands when pushing out the pistons to make sure they are out of harm's way. 5. Place the air gun nozzle into the brake line inlet. (6.) 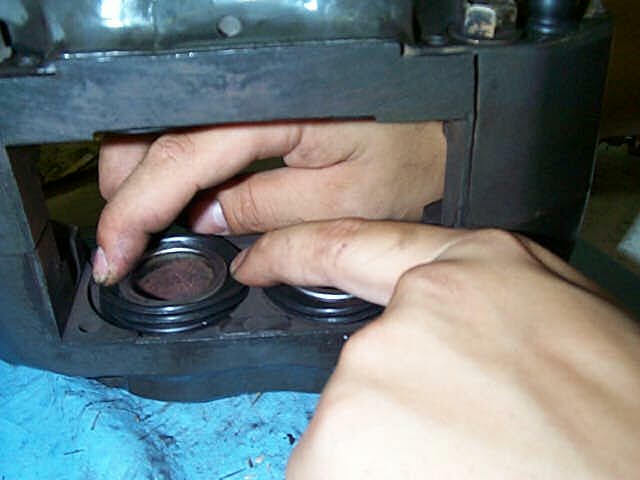 Tap the air gun trigger until the piston pops out. (7.) If a pressure regulator is on the compressor, drop it down to 20PSI and work up to higher pressure as required. Again, be careful when pushing out the pistons because they can come out with some force behind it. 6. 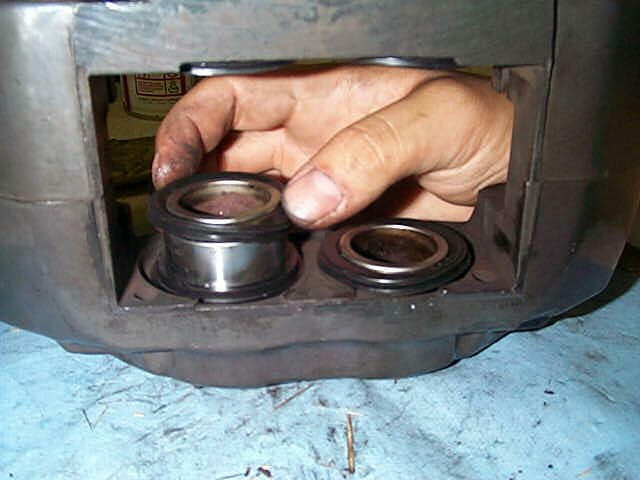 Once the piston is out, remove the old rubber dust cover from it and clean it with some brake cleaner (8.). Grease the new one with the grease provided in the seal rebuild kit and wrap it around the piston. Make sure to put the boot the correct side up. 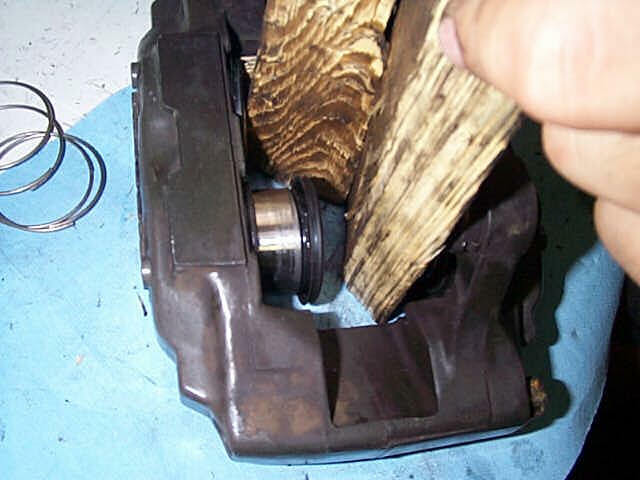 The boot will need to cover the ring around the caliper as it was when removed. 7. Use a small screwdriver and carefully pry out the rubber o-ring inside the caliper (9.). Be extremely careful not to scratch the cylinder walls! Clean out any excess debris inside the caliper with brake cleaner. Use more grease to lubricate the new rubber o-ring then install it into the caliper. 8. 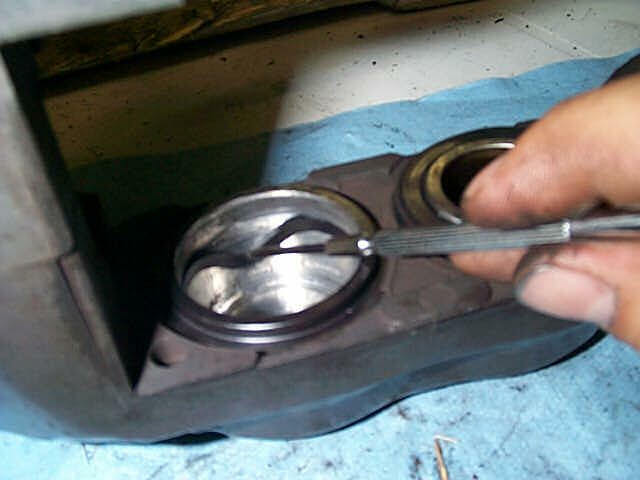 Place the piston with the new dust boot into the caliper and slowly press it back in place. 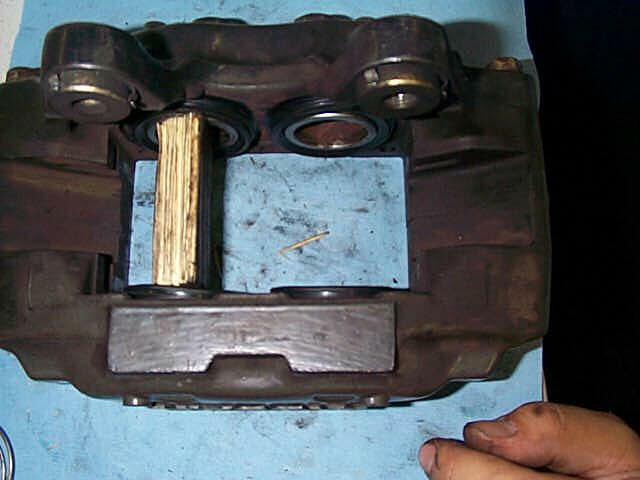 Make sure the piston is properly aligned or it will not go back into the caliper (10.). 10. Repeat steps 3-9 until all 8 pistons are rebuilt (12 if you are doing the rears as well). Nothing to it and no more brake fluid leaks! Reassemble everything in reverse order and bleed the brakes.